The 21st edition of the Men's Junior (U21) Handball World Championships is taking place in Algiers from July 18 to 30. 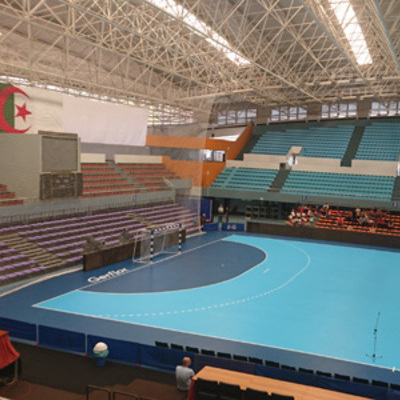 24 teams divided into 4 groups will compete (among them : France, Norway, Croatia, Spain, Brasil, Germany, Algeria, Egypt...), all matches will be played in La Coupole d'Alger and Harcha Hassan arenas. For this event, Gerflor has supplied the indoor sports surfaces for both arenas - 2600 sqm in total - of Taraflex Sport M Performance sports floor (colours London Light Blue and Blue). We wish good luck to all the teams!